Brown recluse spiders are small, yellow to tan, non-hairy spiders with a characteristic violin pattern on the back of the cephalothorax (the body part where the legs attach). These spiders are not aggressive and bite only when threatened, but their venom is extremely poisonous and causes tissue death in the area of the bite. Symptoms of a brown recluse spider bite include severe pain at the site and redness of the area. Sometimes there is a purple or blue area around the bite that is surrounded by a whitish ring and a large outer ring in a bull's eye pattern. Eventually, a blister forms at the site if the bite and sloughs off to leave a deep ulcer that may turn black. Associated symptoms can include fever, nausea, vomiting, headache, and muscle pain. Brown recluse spider bites often go unnoticed initially because they are usually painless bites. Occasionally, some minor burning that feels like a bee sting is noticed at the time of the bite and a small white blister develops at the site of the bite. Symptoms usually develop two to eight hours after a bite. Keep in mind that most bites cause little tissue destruction. severe destructive necrotic lesions with deep wide borders (rare). The brown recluse venom is extremely poisonous, even more potent than that of a rattlesnake. Yet recluse venom causes less disease than a rattlesnake bite because of the small quantities injected into its victims. The venom of the brown recluse is toxic to cells and tissues. This venom is a collection of enzymes. One of the specific enzymes, once released into the victim's skin, causes destruction of local cell membranes, which disrupts the integrity of tissues leading to local breakdown of skin, fat, and blood vessels. This process leads to eventual tissue death (necrosis) in areas immediately surrounding the bite site. 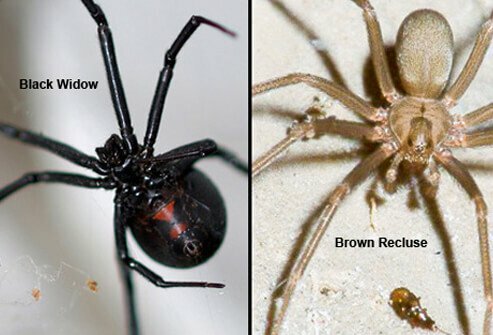 In the U.S., most spiders you will find are harmless, but the black widow spider and the brown recluse spider are exceptions. Both types of spiders are more common in the southern U.S. and in warm, dry climates. Within these areas they tend to be found in environments that are undisturbed such as basements, closets, attics, under sinks, or in wood piles.